Making these adorable egg rabbits is easy and fun. Just follow the step by step instructions below. These make wonderful springtime or Easter decorations. Template print outs at the bottom of the page. Be sure to copy the rabbit templates on cardstock paper. Spray paint of different colors or water proof craft paint (Use many different colors you like). Print the template images below on cardstock paper and set aside for later. Take an egg, and with the needle pierces a small hole at the top . Drill a second hole at the bottom of the egg with the skewer. Then, over a bowl, blow through one of the holes to completely empty the yolk and egg white inside the egg. Clean the inside of the egg and the egg shell well with water being careful not to break it. Let dry for several hours. Meanwhile, you can use the egg yolks and whites for a recipe or for some scrambled eggs. It would be a shame to throw it away. Once the egg is dry, you'll be able to paint it. The color you'll choose will be the dominant color of your rabbit. To be sure to paint the entire surface of the egg evenly, placing it on the skewer while you sprayed paint and leave it to dry. 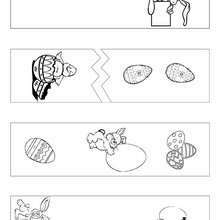 Then, cut the bunny template images you want to place on your rabbit egg (two ears, two eyes, one nose and one rectangle for the body). 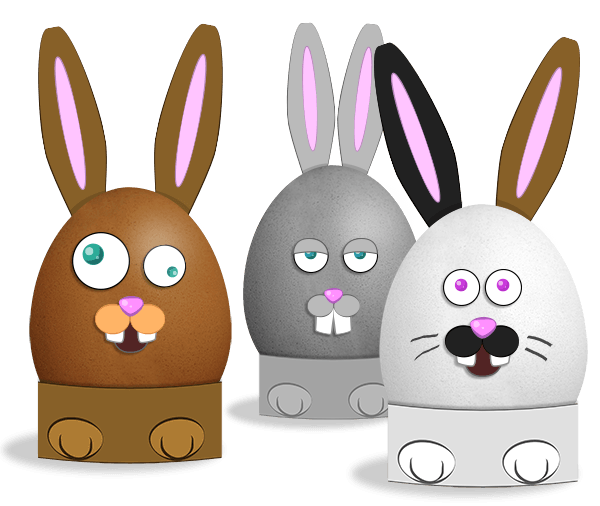 You do not have to choose the same color you used to paint your egg, your rabbit can be several different colors. The rectangle cutout is used to hold the egg and serves as the rabbit's body. Make an arc and glue the ends together. Glue the cutout images onto the egg, arranging them on the egg as you like. Then place the egg on the paper base you made earlier. And now, if you want you can create a dozen or more of different rabbits to decorate the house for Easter! You can even draw mustaches or other details on the egg. This craft is very fun, just use your imagination! And now, if you want you can create dozens of different rabbits to decorate the house for Easter! You can even draw mustaches or other details on the egg this gives you free rein to your imagination! Hellokids has a selection of fun gift ideas for Easter!